Get James Scherer to personally send you his new posts. Think about your Facebook newsfeed for a second. What does it look like? What do you see when you arrive? If I head over to Facebook right now, I see a screen chock full of auto-play, Facebook-created videos of "friend day," I see dozens of pictures, status updates, trending news stories, people I may know, game recommendations, upcoming events, and more. And that's not even including the Facebook Ads I see on both the sidebar and in the newsfeed itself. Needless to say, creating an ad that stands out from the overwhelming stimulus of a Facebook newsfeed is a tall order. But if you want to succeed with Facebook Ads, you have to give it your best shot. Next, simply select from the 8 call-to-action button choices. I've found "Learn More" works well for the clicks-to-website objective. 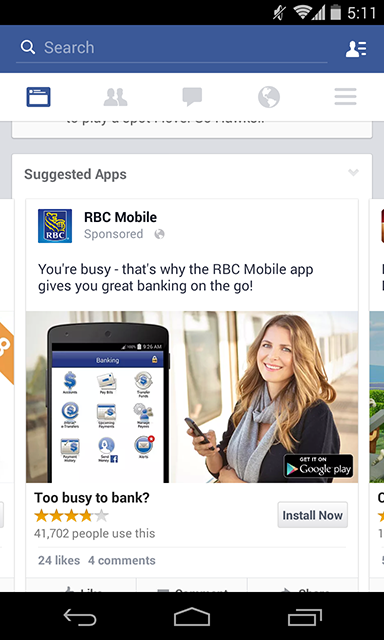 A smiling woman is always a good call for your ad image, and I like that this advertiser featured a screenshot of their app as well. The messaging "you're busy... " provides context for why this app is relevant to the viewer and also communicates value. Just as with a landing page, value propositions are essential in an optimized ad. Featuring the four-star rating and "41,000 people use this" is a great way to show social proof: "if someone like me uses and likes this app, I will as well." It's a timely ad (though would have been more expensive as a result) - right around the Super Bowl, when people are thinking about having guests over. 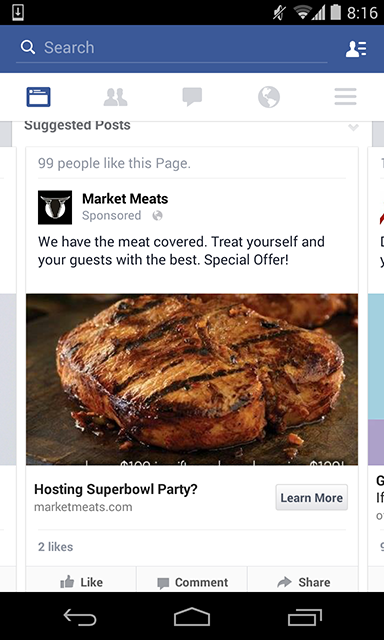 Half of good Facebook Ad design is knowing what people are thinking about. The copy "Hosting a Superbowl party?" and "We have the meat covered" is also a way to hook people who are hosting and then address a pain point they might be having. Also, "Special Offer" is always good, even if the advertiser doesn't mention what that offer is. The image is not just simple (avoid detail in your Facebook Ads, it also contrasts well. Brown and dark red are not colors you see that often on your newsfeed. Super bright colors are always a great way to attract the eye. 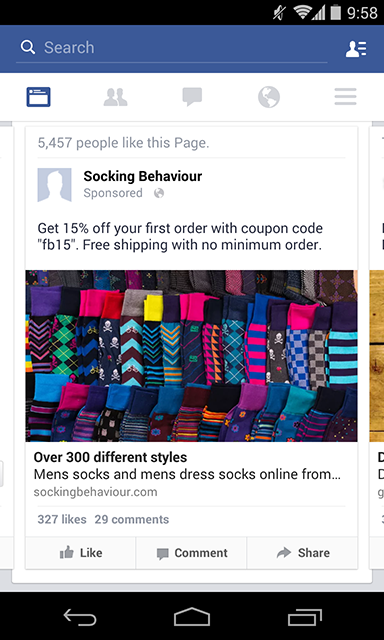 Discounts and offers are my top recommendation for a Facebook Ad, and featuring what that discount is (front and center) is best practice. It also addresses pain points, as in "those socks look nice. Oh, they have 15% off as well as free shipping? Awesome!" The Unique Selling Point (USP) of "300 different styles" is a great way to tell ad viewers that the socks I need, no matter what kind. If you're an e-commerce business with a lot of stock, this is a great way to showcase it. Again, Yelp catches the eye with bright yellows, oranges and reds in this ad. Again, featuring a screenshot of the app they're promoting is a great way to show its power and appeal. This app is also super appealing to the big city audience it was targeted at. 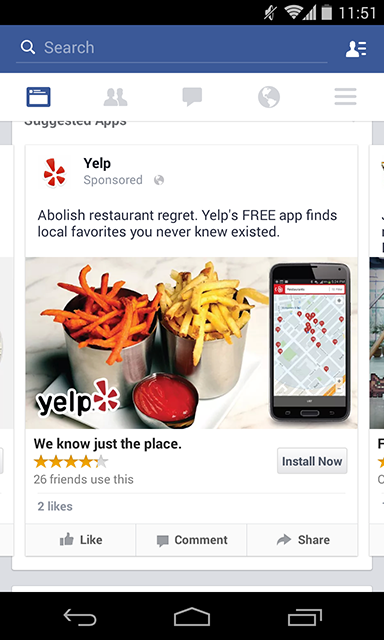 It addresses a few value points: "abolish restaurant regret," "find local favorites," and "[restaurants] you never knew existed." Use color that contrasts clearly with the blue and white of the Facebook newsfeed. Use simple, clean images, with large text on them (20% of image max). Use words like "free," percentages and dollar signs to catch the eye with value. Break down the value of engagement. Tell your ad audience why they need your product or promotion in no uncertain terms. If you're promoting an app or software, use screenshots to show off the product. Use customer testimonials and reviews as social proof. 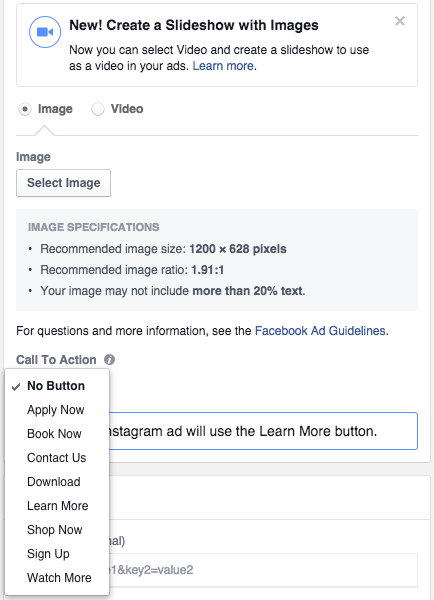 "6 Facebook Ad Image Best Practices that will Send your Click-Through-Rate to the Moon"
James Scherer is the content editor at Wishpond. When he's not writing or designing for Wishpond he's risking his life biking around the city. Reach out to him on Twitter @JDScherer.